The veg garden is up and running! This was our first winter in our new home and we were blessed with many friends, family and neighbours visiting us over the Christmas period. 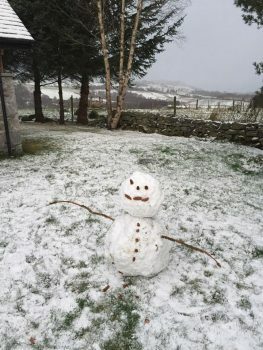 We were spoilt to have snow, and even for a few days we had a snow blizzard, but we still managed to get out into the garden to build a snowman. One of the wonderful advantages of the location of Pinewood is being on top of the hill overlooking the Beauly Firth, which kept coming in and out of view as the weather improved or got worse. But we were never cut off. We managed to drive down to Reelig Glen, which is just less than a mile away, to walk the dogs on Boxing Day. It was snowing still, but a lot of the time we were under cover from some of Britain’s tallest trees. Hopefully in 2017, we will have visitors in Pinewood Steading for Christmas and New Year, but we have a little way to go first in decking it out to the high standard we are aiming for. Come the New Year, we will complete the furnishing and decorating and aim to be ready for February. We wish all our friends and family, and new visitors in 2017, a happy, healthy and joyful New Year!